Hello, hello. Well the diet has been going very well this week and its half term - well I never. Exercise not so good - no work out since my last blog post. I took the kids to the park today and have completed my fitbit steps but haven't broken out in a sweat even though have been up and down like a yo-yo. Sadly, that doesn't count. 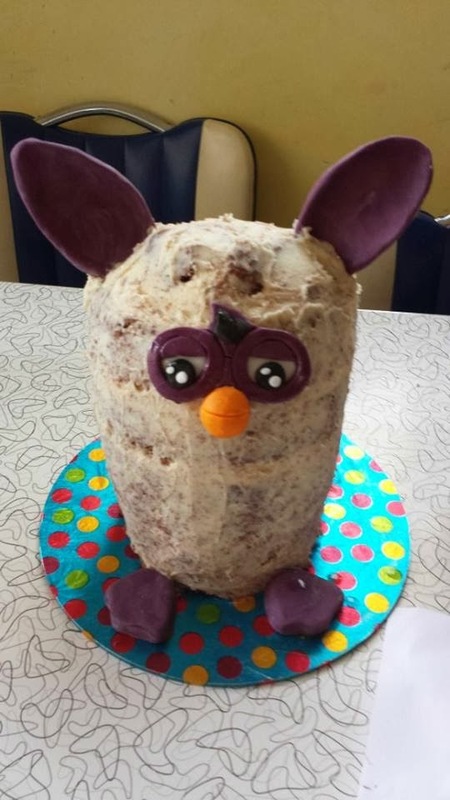 Anyhow, I have completed the Furby cake for my daughter's birthday and party on Sunday. So I thought I'd do my obligatory how to guide. Not that you'll ever make one and, in fact, you can buy a version in Asda. So you see there is actually no need to do this. As its half term and I didn't want to be making this cake late into the evening - I made the ears, feet and face yesterday after tea-time. Here they are all stacked up with butter cream. I used 750g of icing sugar and 250g butter with some milk and vanilla essence. This did the cakes and the 'crumb coating' below. 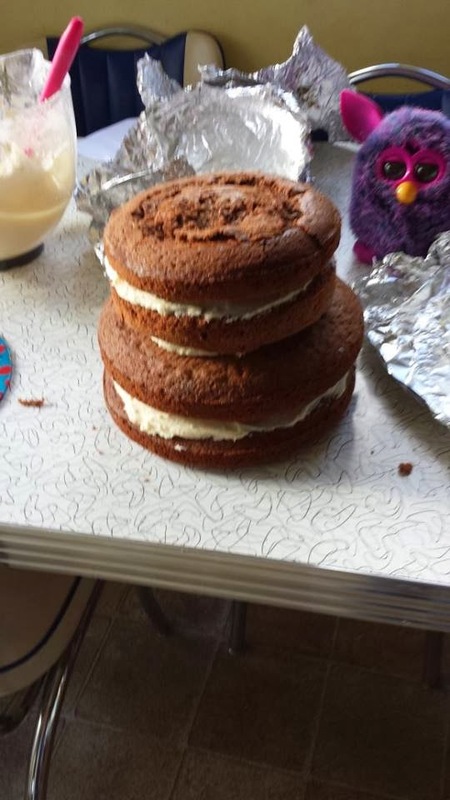 Essentially you cover a cake with the butter cream to lock in the crumbs and fill in the gaps etc. 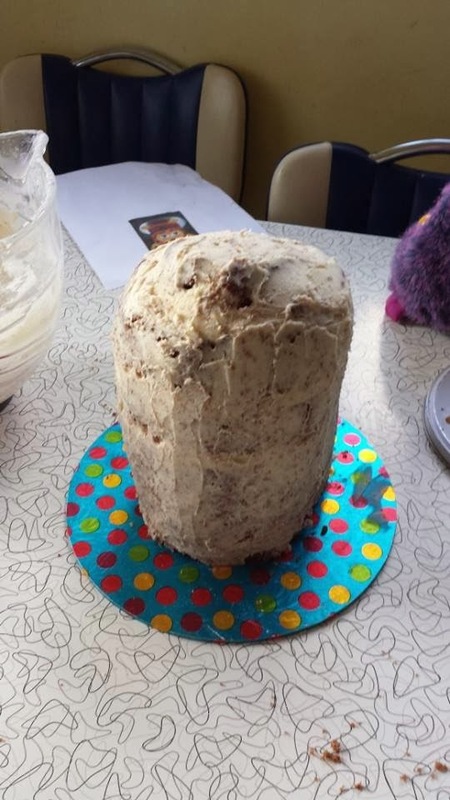 As you know I'm a tad slap dash when it comes to my cake creations - I don't tend to make things properly to scale - I would if I didn't have the kids around and had the inclination but I don't! This was quite a fluke as when I turned it around the back looked better than the front which I used. I actually like him naked with his crumb coat. What do you think? I put cocktail sticks in the ears to held with the sticking. I must remember to take them out when it comes to cutting it up otherwise I'll be strung up by angry parents. 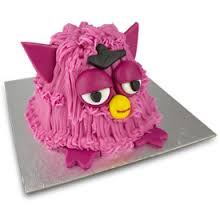 You could also shape ears using rice chocolate krispies and freeze which works quite well for this type of thing. 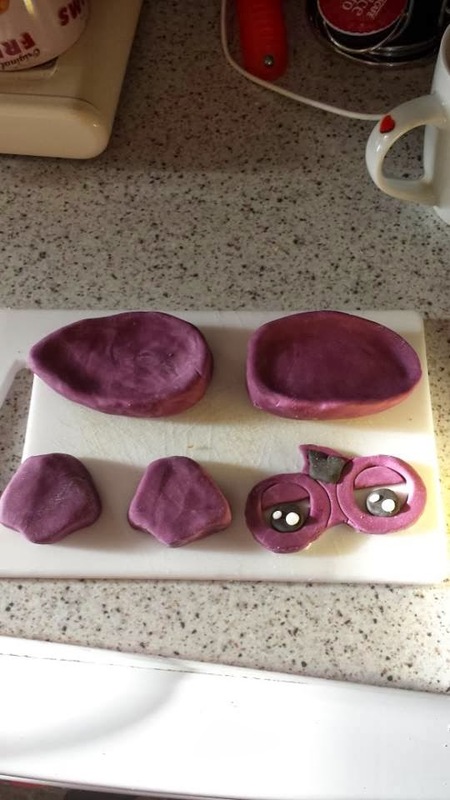 Now I had to use a lot of my purple food colouring (the good stuff which is the paste) - I probably could have used a bit more to make it darker but I was conscious of the kids going wild at the party. 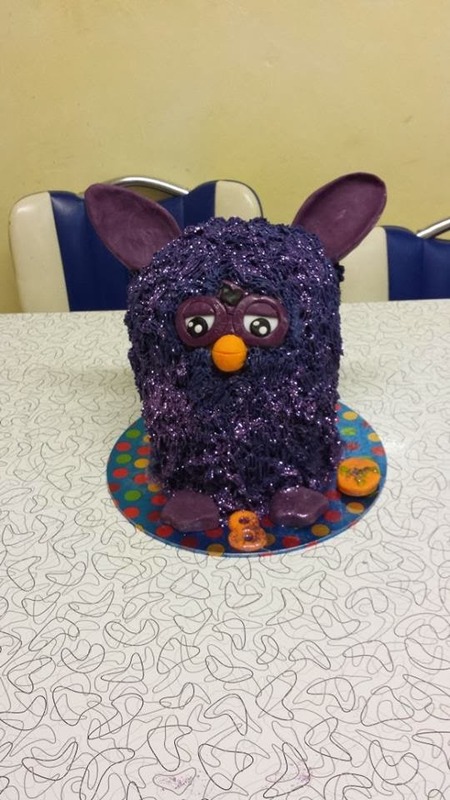 Also the real purple (on the actual Furby) has specks of a pinky red but as long as it looks like a Furby that's all that matters. I used the piping nozzle which is know as the grass one - it was a bit too wiggly for my liking but out of all the nozzles it was the best one for the job. The amount of butter cream and icing I used was enormous!! My kitchen aid did me proud. To give him a bit more definition I sprinkled him with purple glitter which, naturally, I had kicking around the cupboard. As you do. 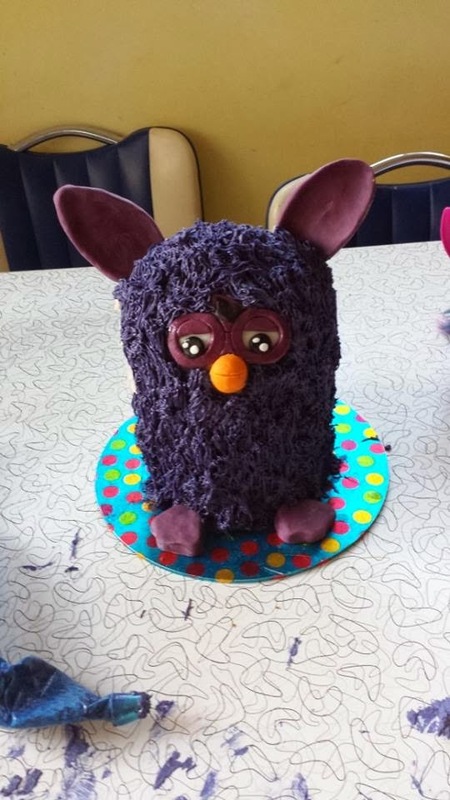 Structurally he should be shorter, in fact, I could have cut a third from the bottom to make him the right size for a Furby but that would mean less cake and who wants that?! he looks brilliant :) much better than the Asda one!